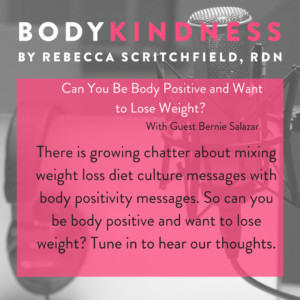 Podcast 13: Can You Be Body Positive And Want To Lose Weight? Whether it’s the election or TV shows, there’s been an explosion of stories about weight stigma, self acceptance in the news and social media. We think it’s great that this conversation is growing so we’re diving right into this timely topic today. What is body positivity? There’s not a singular approved definition. It’s a way of life and philosophy of respecting our bodies and treating them well that had its origins in the fat acceptance community. 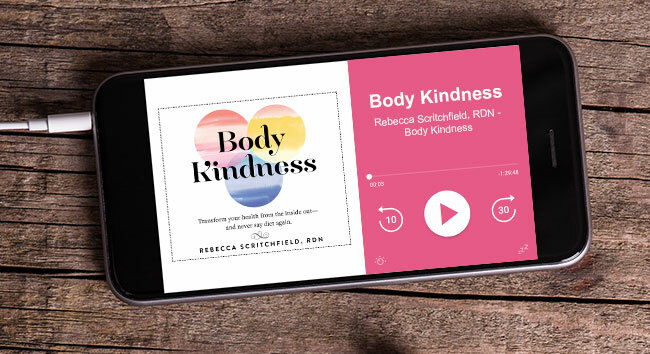 The difference between body positivity and body kindness is that body kindness is a philosophy and a way of being that helps you to be body positive. Body positivity is trending so much that I’m nervous it may jump the shark. There is growing chatter about mixing weight loss diet culture messages with body positivity messages and it’s making some people angry. Those who started the body positivity movement are moving to terms like “fat activism” and “fat positive” to ensure there are safe spaces where you can be fat, not just a fat person trying to lose weight. I asked Bernie if he thinks he can be body positive and want to lose weight. He’s unsure of his feelings and related to my former client Ashley who wrote recently, “I’ve only ever seen weight loss through the lens of dieting”. YouTuber and body positive advocate, Fat Girl Flow said in a recent video that it can be triggering for those trying to find body peace to see weight loss talk in body positive online spaces. We talked about the tendency to “give credit” to weight loss when we achieve goals. For example if you make lifestyle changes and happen to lose some weight and have less knee pain, you attribute that to the weight loss rather than your actions. This associates knee problems with weight when people of all sizes have knee problems! There’s a lot of nuance there, but if we need to understand that weight loss – even it is your experience – may not be a helpful conversation in a body positivity space. Is it helpful in our culture of weight stigma? Our culture has taught us that dieting and weight loss are the markers of good health. Yet many studies have shown if you take two people and gave them the same food and exercise plan their outcomes are different. Studies aren’t perfect but it’s a great example of how we’re not math equations. We’re so geared up for weight loss as the desired outcome, we can give up quickly when the results don’t happen, especially if you’re a chronic dieter. You end up missing out on the positive benefits of habit change. 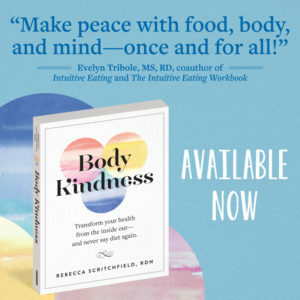 My view is you can’t control your honest desires and “wants” — they are thoughts and feelings — but you can accept you feel that way, acknowledge that diet culture and society plays a role in creating them, but focus on the actions you would take – losing a certain amount of weight is not an action. 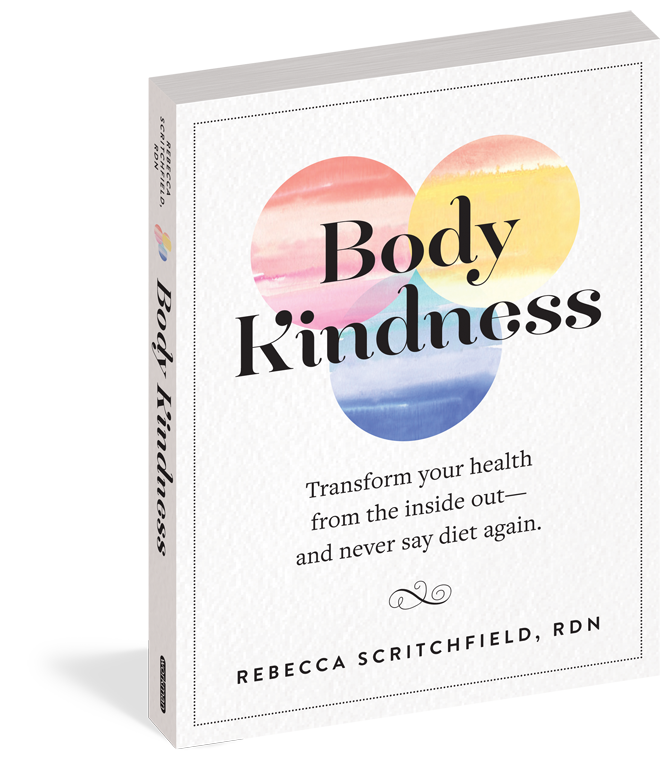 So you can be body positive, reject dieting (and want to lose weight at the same time) and focus on a healthy approach to habits. If you lose weight you’re not kicked out of the body positive club. If you don’t lose weight you aren’t disappointed. This can be a path toward even more body positivity and acceptance. It’s not body positive to sell a person a diet or promise a weight loss income for someone to “earn” body positivity. Bernie says his thoughts towards his body are evolving, when they started podcasting he wasn’t in a good place and now he is starting to own what’s good about himself and realising he is more than his struggles. We discussed our mixed feelings about the new show This Is Us which has a fat character Kate. I was disappointed that Kate’s battle with her weight was such a part of her story, when it looks to me like she is buying foods to binge eat – not healthy at any size! Bernie hated that her fridge was full of junk food and felt it was extreme and cliched. I did love that her family does not judge her based on her weight. When she asked her brother to tell her to lose the weight, he did not. Kate’s own voice is the loudest that her weight is a problem. I would like to see the real problems get addressed – her mental health. We’re both curious to see how this show evolves over the season and trying to keep an open mind. If she does have binge eating disorder she shouldn’t be in the weight loss group – will they show her struggling more? Will they give her the help she needs? And now on to politics! If you Google “Trump weight stigma” there are 340,000 results with articles on fat shaming, weight bias and weight stigma from major media outlets. I’d never have predicted that this election would put these topics on the agenda. It really took off when Trump was shaming the former Miss Universe Alicia Machado and she said he’d contributed to her eating disorder. These issues go beyond partisan politics and I’m grateful they’re getting attention and entering our conversations as we need to be aware of the harm of weight bias and stigma. We know that discrimination and shaming hurt health. Don’t just blow off Trump as an extreme because our culture is not too far from off from what he is doing and saying. I’d encourage everyone to read the articles below and see if that changes your mindset and takes your body kindness practice deeper. Have you internalised weight bias? What are the values that you hold about being good to yourself? My Facebook live chat – Can you be body positive and want to lose weight?